This Easter why not take the kids out for some real outdoor adventures across South Essex? From letting them explore the great green parks, to seeking some thrills along the Southend esplanade. There’s plenty of great value days out to keep the little ones (and grown up ones) entertained, whatever the weather. Make sure to get your Kids for £2 train tickets and take them out for less on weekdays over the holiday. The National Trust has teamed up with the Easter Bunny to create a countrywide hunt for those colourful chocolate egg treasures. There are over 260 hunts taking place across the country, all of which will be supporting vital conservation work at natural and historic places. There are also games, craft activities, puzzles and much more once there, so be ready for a full day of fun and discovery. How much? Hunt cost: £2.00. Admission fees may vary. How to get there? Enter your postcode here to find your nearest hunt. Typically we find any excuse to visit Southend’s (and probably Essex’s?) 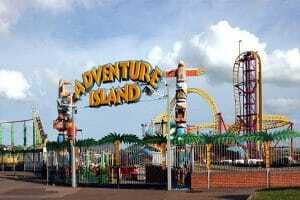 best attraction, Adventure Island. The thrill of the rides, the buzz in the air that comes with a theme park, all make for a thrilling family outing. There are also activity areas, crazy golf courses, music and performances too, so there’s something for everyone. But best of all, it’s right on your doorstep. How much? General ticket prices vary from £20 – £30 (depending on the height of the customer), however discount tickets are also available when you take the train. Find out more here. How to get there? Take the c2c train to Southend Central, and then walk approximately 10 minutes towards Southend Pier. 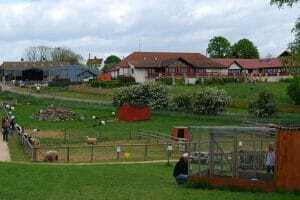 Finally back in the open season, the Rare Breeds Centre welcomes you once again to come and visit the furry residents that reside at Hadleigh Farm. This family friendly day out offers those curious children the chance to get up close and personal with goats, sheep, pigs and not forgetting the Dylan the donkey and Cookie the Exmoor Pony. There’s also a Willow Maze, pedal tractors, play area and sandpit to boot, so there’s plenty to keep you occupied. How much? Adult admission £5.20. Children aged 3-16 years £3.80. Less than 3 years old is free admission. How to get there? Located in between both Benfleet and Leigh-on-Sea stations. However exiting at Benfleet Station gives you the opportunity to walk through Hadleigh Park. If you’re looking for something that’ll keep the kids entertained and in good spirits this Easter holiday, then the Palace Theatre might just be the right place for you. There’s a range of children’s shows and workshops that promise to give the little ones a fun and exciting day out. Shows include ‘Twirlywoos Live’, ‘Family Music Workshop’ and ‘The Amazing Bubbleman’. How much? Prices vary per show. Some family discount tickets are available. How to get there? Take the c2c train to Westcliff Station, the Palace Theatre is then either a 5 minute taxi ride or approximately 20 minute walk. 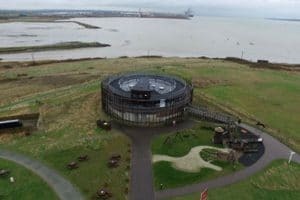 Situated on the Thames Estuary, the picturesque reserve gives a great chance for the family to get away from the hustle and bustle of it all. There’s a whole host of events and activities taking place over the coming weeks that’ll be sure to excite all personalities big and small. Some notable events happening are ‘Kids’ Astronomy Talk & Crafts’, ‘Easter Egg Crafts’, ‘Easter Funday’ and ‘Survival & Campfire Cookout’. If you’re lucky you may even see some of the rare resident wildlife milling about too. How much? Free, however donations are recommended. How to get there? Take the c2c train to Stanford-le-Hope, then take a short taxi ride or 1.6 mile walk to the Thameside Nature Park. Come along and observe some of the swimmers from the deep seas at Southend’s Sealife Adventure aquarium. This aquatic motley crew ranges from colourful fish, stingrays, penguins and even a shark or two. But it’s not just water breathers you can see, there are also meerkats and monkeys for you to meet too. So splash out on a fun filled day for your curious kids and enjoy an ice cream on the Southend coast after your visit. How much? Ticket prices vary depending on age and group size. Buy tickets on their website for an online discount. How to get there? Take the c2c train to Southend Central and walk approximately 15 minutes towards the pier and along the esplanade.